When entering a gardening center or hydro store for the first time, the selection of cannabis fertilizers can be very intimidating. With such a variety of different products, it can be difficult to narrow down the best option for your grow. Every grower wants to have an idea of what their nutrients contain when they’re feeding their cannabis plants. One question that keeps coming up is “What’s the difference between a powder cannabis fertilizer and a liquid fertilizer?”. Besides the obvious difference between a solid and a liquid, the differences can be hard to ascertain from only reading the labels on products. While some growers are quick to say one is better than the other, experienced growers know that there’s a time and place for each. Let’s compare liquid cannabis fertilizers to powder ones. This way we can make a more informed decision on what nutrients to buy. Many liquid base nutrient systems often come with an “A” solution and a “B” solution. The reason for this is that the nutrients contained in the liquid fertilizer solutions will react with each other when combined. Because of this, these solutions need to be added separately to your water supply. This isn’t a problem for powder cannabis nutrients. Powdered nutrients don’t react with each other until they are wet, so having a part “A” and “B” is not needed. 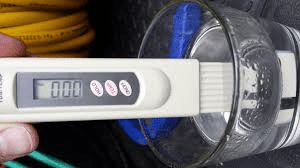 A TDS (Total Dissolved Solids) meter is used to measure the total amount of dissolved particles in your water. It will display the value as PPM (Parts Per Million). These meters are used to help maintain a consistent amount of nutrients. By measuring your source water first. Then comparing to the mixed nutrient solution. You can be confident the nutrients are fully dissolved every time. Liquid cannabis fertilizers will dissolve in water much more quickly than a powder. If powder fertilizer aren’t dissolved properly, they won’t work as effectively. The best way to ensure that a powder fertilizer is diluted properly is to dissolve a little first. Dissolving the recommended dose of powder into a small amount of water is best. Once you have this solution evenly mixed, you can add it to your watering can (or reservoir for hydroponic grows). Liquid fertilizers also contain a few solids which may settle. When using liquid nutrients, be sure to shake up the container before measuring your dose. Liquid fertilizer are made up of mostly water. This makes liquid fertilizer much bulkier and harder to store. Moving around huge jugs of nutrients can be very hard on the back. If you’re ordering nutrients online, liquids can be more expensive to ship and are prone to leakage. Powder fertilizers are lighter because you add them to the water yourself. Because you’re working with a powder, there’s way less of a chance of spillage and waste. Ordering them online usually comes with cheaper shipping options too! The best cannabis nutrients should have a veg and flower product. Each designed for the two most crucial stages of the cannabis life cycle; vegetative and fruiting. 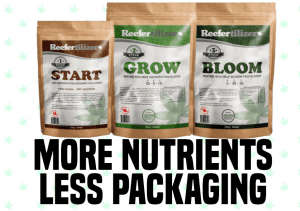 Using a powder cannabis nutrient like Reefertilizer can make the growing process much easier for beginners. 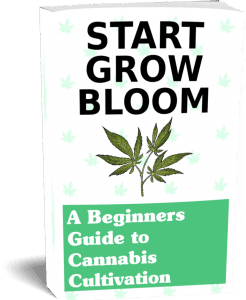 They’re grow and bloom fertilizer are perfectly suited for all types of cannabis plants. They also come highly recommended by their users. What’s The Difference Between Powder and Liquid Cannabis Fertilizers?